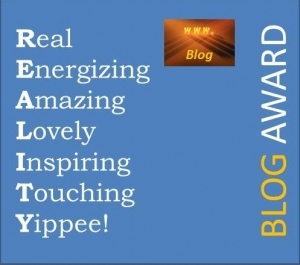 Ivon at Teacher as Transformer just blew me away by nominating my blog for an award called the Reality Blog Award. As I mentioned in previous blogs, whether we realize it or not, we’re making friends through our shared interests, thoughts, lives and our willingness to help others. This award is confirmation. Thank you, Ivon. Here’s the award. Isn’t it cute? I follow Ivon’s blog because he shares quiet wisdom and beauty. It’s always a treat to see what he’ll post next. From what I understand, the nominee can decide what they would like to do based on time and other considerations. There are no rules per se. I followed the template that Ivon provided, but each of us can do what makes us happy on this award. I’ve been a writer for more than 25 years. But I would have pulled the stories off my hard drive much earlier and became an “author” around the same time. I think I’d repeat 40. By that time, all the insecurities of youth are gone and replacing them are confidence, focus and the realization that you shouldn’t take yourself too seriously. Sell my books, and most definitely! My three-year-old grandson. He’s brought so much joy into my life. I’d like to see the world as he does just for a day. I nominated 16 different blogs I visit regularly. They include blogs on writing, photography, poetry, advice, opinions, and humor. I visit quite a few blogs, but these in particular have a way of starting or ending my day on just the right note. I’d like to acknowledge them. If you get a chance, visit their blogs. You’ll see what I mean. This award does not go with any specific “rules.” Instead each nominee can do whatever feels good to them. However, the award demonstrates my appreciation for their thoughts and talents. Thanks for making my world a little cooler. This entry was posted in literature, Thoughts, Writing and tagged awards, blogs, Writing. Awesome, thanks for the new address. You deserve the nomination. Your writing is beautiful. I think I said, “Me too,” to almost every answer. Congratulations. Lol …thank you and congratulations to you also! Congratulations and thanks for passing along your good fortune! Thank you and you’re welcome! Please add this award to your wonderful “Freshly Pressed” blog. I’m inspired each time I visit. Hi Nett, thanks for tagging me along here. Congratulations and goodluck! Thanks and you’re so welcome! I enjoy reading these ‘things about you’ parts of the awards acceptance. I like that you would be 40 again. I’ll be fifty in November and I’m not minding that at all! Congratulations on your award and happy writing! Thanks so much for your kind words! For me, turning 40 and even 50, was a breeze. Much more relaxed and laid-back. We’re practically twins …my birthday is in November as well! Congratulations and enjoy your milestone birthday and be good to yourself. Do something spontaneous because you’ve earned it. I think that’s why it was so easy for me. I did what I wanted to do on MY birthday. Congratulations on your award, how wonderful for you, I think that is one of the nice things about WordPress, and the community. Thank you so much for nominating me for this award. Thank you! I agree there’s a certain camaraderie among WordPress bloggers. And you’re welcome. It’s my pleasure. Your work is beautiful. Thanks so much for nominating The Violet Femmes blog. I’m glad it brings some enjoyment to your day. You’re more than welcome, Maria! I love Violet Femmes. Even your name makes me smile!